Fri, 21 Jun at 10:00AM - Sun, 23 Jun 2019 at 3:00 . From the Generator team behind Evolution Emerging Festival (2008-2018), Tipping Point brings you Tipping Point Live! Weekend Ticket allows entry in to all Tipping Point Live festival venues and activities across the weekend (excluding family activities) Friday 21st – Saturday 22nd June, subject to terms and conditions and venue age limitations. Saturday Ticket allows entry in to all Tipping Point Live festival venues and activities on Saturday 22nd June only (excluding family activities), subject to terms and conditions and venue age limitations. The family programme general ticket grants access to one paying adult and one child (aged 15 months -10 years) to all of the family focused activities on Saturday 22nd June (produced in partnership with CHALK and Seven Stories). If you have a child under 15 months please go to the adult and baby ticket option. 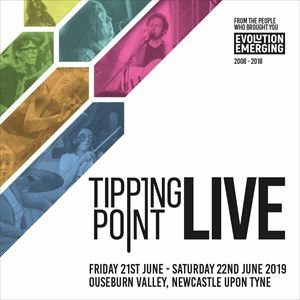 Tipping Point Live is a new music showcase taking place across multiple venues in the Ouseburn Valley, Newcastle on Friday 21st & Saturday 22nd June. Delivered by the team behind Generator’s Tipping Point talent development programme, the new look festival will feature an extra day of showcases, greater diversity of genres and artists, commissions, industry curators, film screenings, masterclasses and music industry sessions, exciting food offers and bespoke events for music lovers with young children.